About me Novice trader. Some good trades, some bad. Always learning. Oil XAUUSD & GBPUSD Waiting for the Oil pop/Rally - Stocks would go boom! It has been quite a retrace. Not even sure what is next! $SPY Weekly look is kinda bearish. 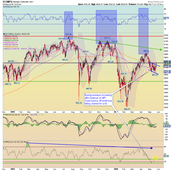 It has bounced off key technical indicators but it is pretty bearish. The repeat patterns are just too eerir. We might just see more range trading like the past 84 weeks(Highlighted yellow) minus to the dips (highlighted red) What do you guys think? Futures didn't get any higher after US Close. I am looking for a big short soon. Miight see a few bounces between this latest channel. Rate Hike off the table, UK Out of Europe. Severe capitulation in most FX pairs - Down down 600 points. This could be bad over the next week, maybe even sooner if some big bombshells get dropped. Cable is looking like it might slip out of this bearish flag soon for fresh downside. Might be limited to 1.34-30 areas. Bounced off this level numerous times now. The break out will be quite large!! Looking for the short side though. Bollinger bands are closing in. I have selected a target of 0.708 levels Looking at other time frames for more confirmation before placing a trade though. Will come back to this a bit later. Gold broke 76 handle few moments ago Looking for a quick TP soon at 39 levels now that more interest has been put back into USDJPY GBPUSD now on the decline after hitting its limit at where the referendum date was set.back in Feb.
GoPro looking to go north I think - Still Cheap Stock. I like the look of $MCD at the moment it is looking quite healthy and ready for another pop. first target for Monday 123-124. But I am hoping for a gap above that on open. Hate the food but I'll happily get into their stock if its going to pay off! No entry until good confirmation though. NASDAQ 100 E-MINI Futures 4hr Follow up. Not a bad call from Thursday! As mentioned in last idea, markets everywhere were red today! Maybe the winds of change. There were a few stocks up in the green defying the market. Will post them later/this weekend! Overall It is still quite bullish but the current EUR markets are waning on stocks. In fact most stocks were in the red today for the most part. Just goes to show that its good to get some solid confirmation before placing any trades Would of got done for some nasty slippage if I had gone long Monday! !